Transmitting AV signals over twisted pair (Cat-5, Cate-5E, Cat-6 etc.) is the cost effective way to distribute sources over medium to long distances. A transmitter at source and receiver at destination and (preferably shielded) twister pair cable in between. 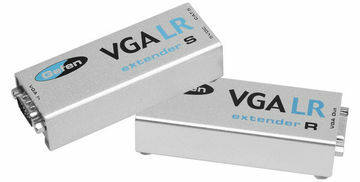 Fore more moderate distances see Standard component and RGB (VGA) distribution amplifiers or for ultra-long distances see Component/RGB over fibre optic.